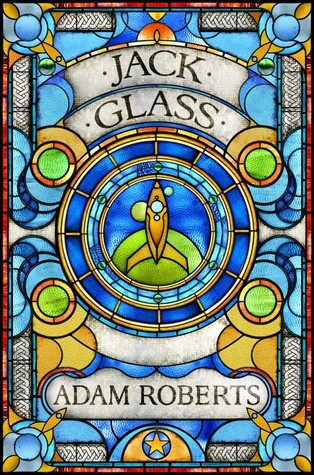 I'd only read a short story or two from Adam Roberts before Jack Glass but the blurbs on his novels have always intrigued me and I've only ever heard good things, so I've actually been meaning to give him a go for a while. I'm glad I did. I love my 1/2 stars, seemingly, so in this case I would have liked to have given 4 1/2 stars. It managed to surprise and entertain me, kept me guessing and got me thinking. The book is in three parts, almost three interlinked novellas, although the second two are more directly connected. The eponymous Jack Glass is present in all three, with an extended cast carried from the second into the third. Essentially, while intrinsically science fiction, the three parts are separate, classically-styled, mysteries. A prison story, a whodunit and a locked room mystery. Although elements of each blend into all three. The only problem I had with the book was the first segment. It dragged a little for me and kept too much hidden before the revealing of the plan. Jack worries he has revealed too much, but I think more hints to get the reader thinking would have worked better. It's a shame because the other two parts got it bang on. In fact, the second two parts were absolutely superb. I loved them. Pageturning, edge-of-the-seat type stuff in places. There's some high concept stuff in there but it's integral to the storytelling and the mysteries, and so smoothly written that it doesn't stick out like it can do in some SF. Actually, the writing in Jack Glass is outstanding in places, with some wonderful observations and turns of phrase. The characters sometimes felt more cerebral than emotional, but I think that is an accurate representation of their nature. I think it did stop me connecting as quickly as I might have, which didn't help with the main thrust of the book starting a third through (parts two and three). That's a minor quibble though, I was connected by the end and entertained throughout. If you like science fiction, and you're looking for something different to the usual, then I cannot recommend Jack Glass highly enough. Push through the first part, because the second two parts are truly brilliant. Sign into Goodreads to see if any of your friends have read Jack Glass.